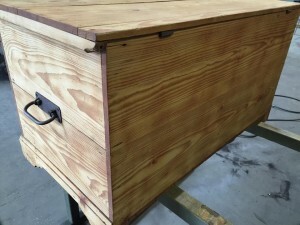 Wooden blanket box , Soda blast cleaned to bring up the grain.. This customer was going for the more rustic look and was very happy with the end result. Soda blasting is suitable for Carbon Fibre, Stainless Steel, Rubber, Chrome, Fibreglass Aluminium, Glass and GRP.